Did you know you can spot penguins and possums in Melbourne and you don’t have to travel long distances for them? We spent a night in St Kilda to see Melbourne penguins and afterwards went to Fitzroy Gardens for possums. There is a colony of Little Penguins living on St Kilda Pier and the best time to see them is at dusk. After you’ve seen the Melbourne penguins you still have to wait for the dark to see possums. A little penguin in Melbourne, Australia. We started our Melbourne penguins and possums tour from Federation Square in Central Melbourne and walked along the Yarra to the Botanic Gardens where we took a tram to St Kilda Pier. Later we came back to the city to see the possums in Fitzroy Gardens. Yarra is the river that flows through Melbourne. From the many Yarra bridges you get nice evening views of the Central Business District and the Southbank. From Yarra bridges you can also see the green sporting areas east of the CBD and the park called Birrarung Marr from where rowboats and canoes set off to the river. Yarra banks are a popular area for joggers and bikers and it looks like almost everybody in Melbourne was running here after work. No wonder they all come here, the walking tracks are very good. For many people in Melbourne it means a high quality of life when they can jog right in the middle of the city. Royal Botanic Gardens and Kings Domain make a large public park and a kind of green oasis between St Kilda road and Yarra River. Walk along the paths of the Botanic Gardens and you can see beautiful plants from all over the world not to mention the small rainforest and Australian desert plants. From the Botanic Gardens it might be wise to take a tram to St Kilda, to get there in time to see the penguins. The bayside suburb of St Kilda is situated in one of the most picturesque points of the bay only less than 10 kilometres from Central Melbourne. The suburb has a seaside-resort atmosphere with fine sandy beaches and a beach promenade and like all seaside resorts it has a number of restaurants, bars and shops. The rocks at the end of St Kilda pier are home of a colony of over 1000 Little Penguins. The penguins make their homes underneath or between the rocks where they get protection from weather. Melbourne penguins spend most of their time on the breakwater or diving in the nearby waters. When the dusk comes you can see them coming back from the sea and waddling back to their nests. They are nice to look at but you don’t see such numbers of penguins as on Phillip Island. There may be some volunteers telling about the penguins and helping people see them and get photos in the darkness without a flash. The volunteers cast red light towards the penguins so you can see them and get photos. Penguins can see different shades of green which they need to find their food in the sea but their eyes don’t see red. And yellow flash lights would make them nervous. In addition to penguins you can see water rats swimming in the waters around the breakwater. The best time to catch a glimpse of water rats is the sunset. On our way back from St Kilda we changed trams at Federation Square. This doesn’t really belong to the nature tour, but I couldn’t help taking a picture. Federation Square is a good example of Melbourne urban nature and the square looks great at all times. The next stop is Fitzroy Gardens and its possums. Like kangaroos possums are marsupials, so the females have pouches in which the young develop. By day you don’t see possums at all since they sleep the days in tree hollows, but at night they become active. You can see possums in Australian parks and gardens. Often when we walked through Fitzroy Gardens at night we felt like someone was staring at us and looking up we saw possums here and there up in the trees looking at us with their big round eyes. The possums looked curious about us and came closer so we could talk to them. 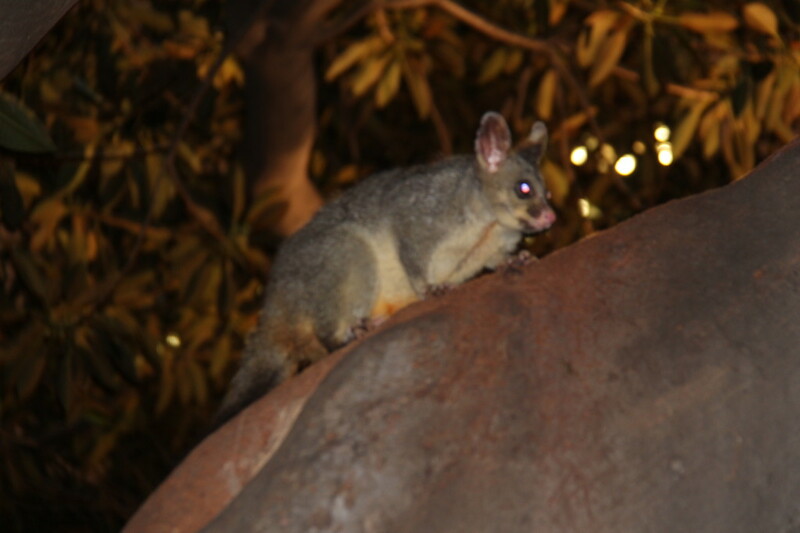 So we also got some pictures of Fitzroy Gardens possums. Sometimes they very much look like small kangaroos, and from other angles they look more like squirrels or monkeys. Funny creatures that we don’t have in Europe at all. We liked these possums so as long we stayed in Melbourne we liked to walk through the park at night. And we also liked going to St Kilda and meet the penguins. Below you have my other posts on Melbourne and in the list you can also find a post on Phillip Island where you can see penguins as well. If you want to know about Melbourne sights see my blog post Sightseeing in Melbourne.